Since martial law was lifted in 1987, Taiwan has become one of the many vital sources of Asian cinematic development. Though his films have shamefully received virtually no commercial distribution in the West, Taiwan’s Hou Hsiao-hsien is now considered to be one of the world’s leading filmmakers. The Puppetmaster is the second in his trilogy of historical films that include A City of Sadness (1989) and Good Men, Good Women (1995). A City of Sadness covers the period from the Japanese surrender to the massacre of Taiwanese by government troops in 1947; The Puppetmaster, the time from the Japanese occupation to Japan’s surrender; and the third, Good Men, Good Women, the period after the Nationalists returned to Taiwan. Completely relaxed before the camera, Li interrupts the narrative several times to reminisce about his life and family. Some of the stories he relates are shown and others are not. According to Li, “The hardest things are separation and death” and in his life, Li had to face the death of his mother, grandmother, grandfather, father-in-law, and youngest son. He relates how his grandmother (Bai Ming Hwa) had a rough life because everyone she lived with died. This prompts his father (Tsai Chen-nan) to tell him to take grandmother to the hills and look after her. When she becomes ill, the doctor tells Li that she will remain alive as long as he stays with her. The minute he is called away from the house, however, the prophecy comes true. 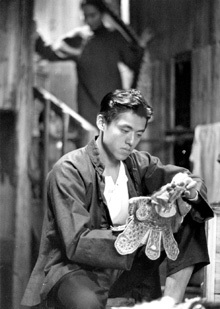 Going against his father’s wishes, Li marries into a theatrical family and becomes an apprentice to a puppeteer named Mr. Li. Three years after the Japanese appoint a new Governor on the island, all outdoor performances of plays are banned and thousands of puppeteers lose their livelihood. Times are hard and commodities are rationed for the Taiwanese. Li is forced by economic realities to put on puppet shows for a Japanese propaganda troupe in Taipei. When the Japanese surrender, Li and his first apprentice return to Taipei where he performs once again on Bingyang Street as the Japanese occupation ends. As the spirit of the Taiwanese people is rekindled, Li once again has his own stage. The Puppetmaster succeeds in giving us an insight into these noble traditions. Yvonne Ng, “Essence And Ellipsis In Hou Hsiao-hsien’s The Puppetmaster,” KINEMA Magazine, Spring 1999.